How to Create a Landing Page? A landing page is one page of a website, created specifically for the role of marketing and advertising. That’s the page where a visitor lands when he clicks on your link in Google AdWords or a similar platform. It’s a great way to inform visitors about a new product or service you’re launching, or simply increase awareness. This article aims to explain the term landing page, its elements and guide you to creating one. Let’s start by explaining the difference between organic and paid search. There is quite a huge difference between the kind of traffic that will land on your landing page. To better understand the way organic and paid search works, here’s a picture. Organic search results are shown in the fourth section. It presents content that is ranked based on their quality and relevance. That’s placed underneath paid contents because no one pays for that. In contrast, paid search results show you content that someone wanted to rank better and make visible on the first site of Google. Paid advertising, allows the page author to choose where he wants to direct the visitor. Call to action buttons are one of the most important things post-click landing page have. There should be no confusion as to where prospects need to click to redeem your offer. That is why you should pay attention to their position and appearance. By placing your CTA button too prematurely on the page, you run the risk of losing conversions. When you place the CTA after you’ve introduced and explained your offer, it’s more likely that visitors will already be convinced to convert. Also, make your CTA enough big to be noticeable. Your CTA button needs to contrast well with the rest of the page. That doesn’t necessarily mean bright colors. You can use a hue, tint, shade, and tone that stands out from the rest of your page and draws maximum attention. CTA copy can be a deciding factor in winning or losing a conversion. Stay away from boring and overused copy, like “Submit,” “Subscribe,” “Sign up,” or “Download.” Instead, be specific and use personalized, compelling words to increase conversions. Also, you can use the most convincing word “free”. Every story starts with a headline, and every good story needs a good headline. The same goes for your online website. The headline is the first thing that visitors see when they land on your page. That is why it should be attractively and compelling. Competitivity will encourage your visitors to stick around long enough to consider your offer. Characteristics of a good headline are clarity, relevancy, and empathy. First, clarity means that there is no need to questions what is your offer about. Second, relevancy fulfills your ad’s promise. Your product should provide everything that you have promised it to provide. Third, empathy should address visitors problem in an emphatic way. It should also be sure to find a solution to that problem. For example, some of the good headline is – “How to” – and then offering a specific solution. Another option is to ask a question and answer it in subheadline or main copy. You can also use your unique value proposition (UVP) to show why your product is better than others. Except headline, subheadlines help support and reinforce the claim made in the primary headline. The headline may not get directly to the point as best it could, but it teases the visitor enough to read the subheadline. White space (aka negative space) is the empty area on your post-click landing page. It helps to draw attention to specific elements on your page. It doesn’t have to be white per se, as long as it fulfills its purpose. White space is a valuable design technique because it helps create a visual hierarchy. Also, it reduces page clutter while improving readability and comprehension. To achieve the goal of your landing page, you should make clear for visitors the action you want them to take and how to get there. Avoid too much information on the page. There should be an amount of negative space to make it clear. Since you want to keep the user on a specified journey, it’s also best to exclude any exit links and to limit navigation. This will guide the user to your call-to-action. Good, a persuasive copy is crucial because this is one of the primary methods to get your point. It shows the benefits of your product and your UVP. Among which the following should be considered. Furthermore, the amount of copy is important. Too much could make visitors feel overwhelmed and leave the page without reading any of it. Too little could seem uneasy about whether to pursue your offer. Another thing that matter is writing style. The most noteworthy point here is to make your copy customer-centric so that it speaks directly to your visitors. Using words like “you” and “your” instead of words like “we,” and “us,” is a great way to show focus on the solution of their problems. Since most online readers only scan web pages, formatting can be very useful. Using various formatting techniques, like bullet points, numerals, lists, and bold copy point out the most important bits of information. SEO is a process to make your website and landing pages more visible in the organic results of search engines. It helps search engines better understand the purpose of your page. However, it is often mixed with Search Engine Marketing. As a result of understanding your page is ranking it higher and the result of that is more traffic. Finally, more traffic means an easier approach to customers and more conversions. 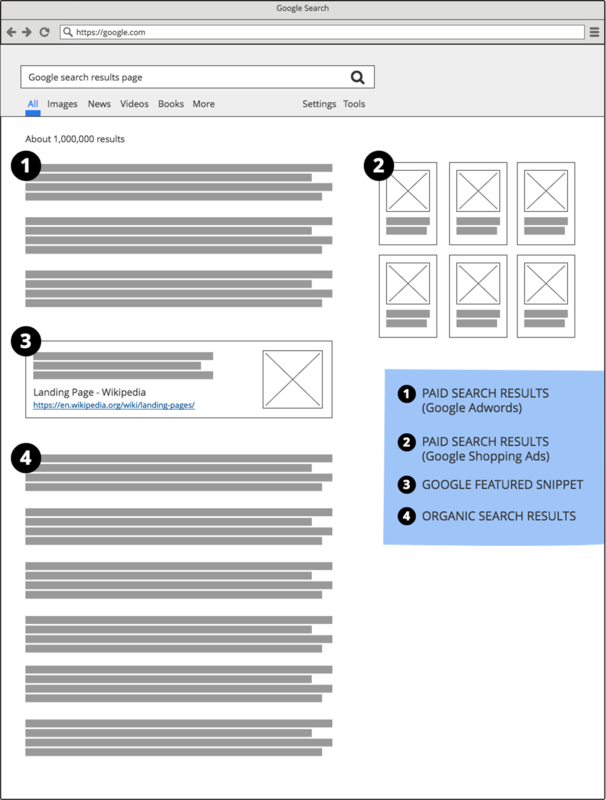 There are four steps to optimize your page. Those are keyword analysis, landing page optimization, link building, and result in analysis. A keyword analysis starts with researching your industry, competitors and potential customers. You do it by creating a list of keywords based on how people search for your product. Group the keywords by your website categories and for landing pages focus on one group of keywords. Compare that keywords with competitors rank for each keyword. SEO landing page optimization means to integrate this keyword in your headlines and subheadlines. Keywords should also be included in body text, image text, and metadata such as page title, description, and URL. Besides, a very important thing is backlinks. Backlinks are like votes for your website – the more high-quality websites link to your landing page the better results. For earning backlinks you can use contacts you have. Just ask them for the link where is appropriate. Another way to get them is to find a high-quality that might find your content useful. You can also share your content in forums and blogs together with sources of your competitors. Last but not least thing about SEO is to track organic traffic and click-through rates. You can use Google Analytics and Google Search Console. Interesting pictures and videos can make the content better and you offer more exciting. Images and icons on your landing page could be interactive, tell a story, or give directional cues towards your call-to-action. What is more, visuals and videos can also be optimized? Landing page images shouldn’t just look pretty. They should also be attention-grabbing, relevant, and assist in the conversion process. Images on post-click landing pages can be used to accomplish a number of tasks. Some of them are to showcase products or product features and introducing employees or highlight customers. Also, they could have human appeal and evoke emotion or tell a story about the brand. Videos can be even more effective than pictures. Having a landing page video can increase conversions by 80%, and 96% of consumers find videos helpful when making online buying decisions. Also, 58% of those consumers consider brands that produce videos more trustworthy than those without. Videos should be strategically placed on the page with a good thumbnail. Be sure to keep your videos short, as users are then more likely to watch the whole video. Today, mobile optimization is table stakes for any website or page, and that applies to your landing page, too. More than 60% of B2B consumers say mobile played a significant role in a recent purchase. Beneath that, 50% of B2B queries are made on smartphones. That number is predicted to grow to 70% by 2020. So as you design and develop your landing page, remember that designing it to be responsive and optimized for mobile is essential. We can say that landing pages are must-have in today’s businesses. Most of the businesses that provide services have landing pages where they present all their service. It’s good to funnel user to the service they tend to buy. For creating a helpful and successful landing page, there are several attributes that should be met. There should be CTA’s and visuals like infographics and illustrations. Every offer should be stated, but also there cannot be offered that’s not in the same niche. A page should have catchy headings to attract visitors on the page and the layout should be modified for all devices. Kickstart small business using crowdfunding! Enhance your game and future proof of the inevitable integration of CX and UX. Take a closer look at how live chat can benefit a business. Learn all about the latest marketing trends in the age of podcasts.